Five children’s libraries located within five community libraries in South Birmingham refurbished thanks to a Wolfson Foundation grant – and BookSpace. Chelmsford Library’s new children’s space and families hub is it at the heart of the city’s family support services. Woodseats library forms part of a new community hub, offering a contemporary and inviting space for everyone. A building with generous space that was previously underutilised, has been transformed by producing exciting designs and concepts for the space. Moulton Library is a bright, colourful and vibrant space catering to the requirements of children under 5 to the elderly and dementia sufferers. The Edmonton Centre brings together a completely refurbished library set over two floors and the council’s Customer Access facilities. Grantown Library is situated in Grantown-on-Spey, a small, popular holiday town in the Highlands, with a population of around two and a half thousand. A challenging and innovative design solution to deliver a flexible space which works for a wide range of customers. A bright, welcoming, modern library for the people of Falkirk. Merthyr created a recreational reading offer to enhance the services at the Leisure Centre, a short walk from the town and its busy Central Library. A project to refurbish the existing family history area to house both lending and research materials at Blyth Library in Northumberland. Plymouth City Council’s decision to relocate the library to the heart of the city was a strong influence on the design idea for the space. Within days of the handover to Renfrew Council Johnstone Town Hall was awarded ‘Development of the Year (Public Buildings)’ at the Scottish Property Awards. 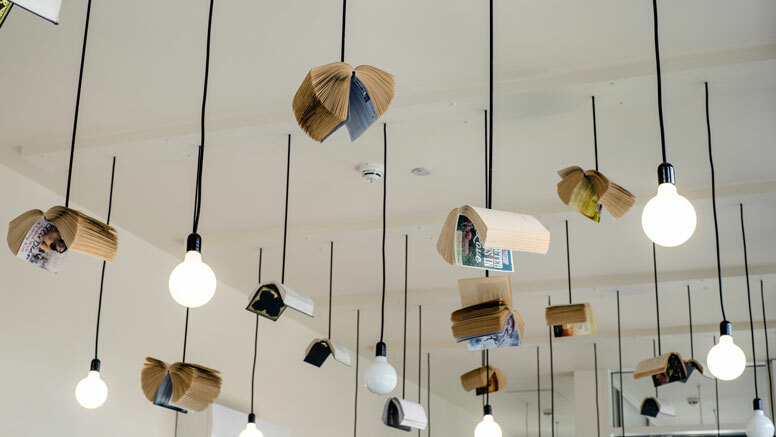 A £2.7million Library and Customer Service Centre in Stockton on Tees, has opened on the site of the town’s former Art Gallery and Council offices. When asbestos was discovered in Bradford Central Library in 2012, the Council decided to move to a new smaller site in Centenary Square. The total renovation of Barrow Central Library, Cumbria, was set in a Grade II listed Beaux-Arts style building. GLL and thedesignconcept worked together to fulfil a vision to break down boundaries between the co-located library and leisure centre. A design and bespoke furnishing project for Solihull Council that brought the street - and its streetwise readers - into the library. A public library was relocated as part of a £23 million project to provide a new joint service centre. A public library design project to incorporate existing shelving and introduce modern technology solutions. An exemplification of future trends in libraries that featured as a case study at the 2013 Edge Conference in Edinburgh. Situated in a Victorian building spread over three floors, the new-look Record Office brings Derbyshire’s past to life for residents, visitors and students. The Craigmillar Library in Edinburgh has brought new hope and spirit to an area seeing renewed investment, with many services brought under one roof. The iconic Olympia cinema site in Bridgeton has been restored to its former glory with the new library as the focal point of this regeneration initiative. The public library was taken out of the centre of this port town and relocated on the outskirts away from the centre of the community. The library, housed on the ground floor, needed to be fresh, modern, bright and contemporary with defined areas worked into the design. As part of the Washington Town Centre library modernisation project, the library needed a light bright interior, with improved access and an exceptional customer experience. The £2.2m refurbishment of Ealing Central Library was opened in September 2008. Lighting, graphics and exhibition spaces invite visitors to visit the upper floors of the new High Wycombe library.